I still don't care what anyone says, I think these are really creative ideas. and I'd love to see that drawing of the other human outfit idea also. Did you ever toy with the idea of introducing X-Men style "image inducers", which shouldn't be to difficult for Donatello to cook up. -->> ..also killer, how Mike's got his chucks stored on his his upper arms. Well, we used to goof on the whole trench coat and fedora thing was..I mean it didn't hide the fact that they weren't human at all...This is actually much more thought out! 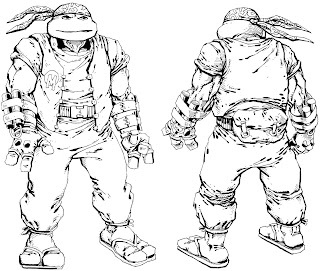 Wasn't Mikey wearing this outfit in the Ninja Turtles 4 concept art that showed up on Steve Murphy's blog this past summer? I wonder if both are supposed to be from the same Ninja Turtles 4 brainstorming sessions. While I hate the ideas for this 4th movie, I LOVE the peek inside to what you guys had thought about doing. Love the blog Peter, please keep it up! The old cartoon had an episode where Michaelangelo could turn human. I remember thinking it was kind of silly at the time, but of course the old cartoon was wacky like that. Also I remember the ugly human masks the Turtles wore on the old cartoon, along with their trench coats and fedoras. I always thought the obviously fake look of the masks made it really funny. I think it's neat when creative people come up with similar ideas like that. To me they seem like they would make awesome toys. I would so get them. As for the movie, I dont think it would of gone very well. How bout a alternate dimension episode. Where these turtles actually exist. I also think that the idea that Donnie would've figured a way to walk amongst humans and not be detected, is past due. I mean, not only is it a Ninja ability, but he is a freakin genious. Great sketches, thanks for posting them.